An automotive clock spring is installed in the steering wheel of the vehicle. The spring retracts and expands inside the steering wheel when steering wheel moves. The primary function of the clock spring is to maintain electric connections of the airbag unit, steering mounted controls such as radio, cruise control, horn, and other entertainment functions, which are mounted on the steering wheel. It maintains electric connections during steering wheel movement and provides important assistance to the driver. The material utilized for clock spring is carbon steel, stainless steel, and copper alloys owing to their advantage over the other materials. Increase in demand for steering mounted controls, government emphasis on passenger’s safety, rise in demand for passenger vehicles and light commercial vehicle and demand for safety features these factors are likely to drive the market of automotive clock spring in forecast period. However, development in the field of autonomous vehicle, change in technology in cars, and improper centering process. These factors are likely to hamper the growth of automotive clock spring market in forecast period. The automotive clock spring market has been segmented based on two categories, which are vehicle type, and region. By vehicle type, the automotive clock spring market has been segregated into passenger vehicle and commercial vehicle (light commercial vehicle, heavy commercial vehicle, and buses & coaches). In terms of revenue, the passenger vehicle segment constituted more than 77.67% market share in 2016. Demand for passenger vehicle is continuously increasing owing to rapid urbanization, increased disposable income, and growing commute and miles globally. Rapid industrialization, and growing construction industry in developing region would drive the market of commercial vehicle in forecast period. In terms of region, the clock spring market has been classified into North America, Europe, Asia Pacific, Middle East & Africa, and Latin America. In 2016, North America dominated the clock spring market. In this region for safety of passengers’ government mandated the airbag for light vehicles owing to this consumption of clock spring is high in this region and it is expected to remain high during forecast period. Regulatory bodies in most countries are implementing passenger safety norms, and have made installations of airbag in all types of vehicles mandatory. Government of Brazil mandated basic safety feature for vehicle in their region from January 2014. In that features vehicle must require airbag and seat belts. Key players in the automotive clock spring market are expected to benefit from the formation of strategic alliances with global players in the automotive clock spring market. Prominent players in the automotive clock spring market are Angotan Auto Parts, Spring Works Utah Inc., Draco Spring Mfg. Co., MHC Linkway Auto Parts Limited, Sanwim Auto Parts, Jinzhou Jinheng Automotive Safety System Co., Ltd, Nardrun Electronic Technology Co., Ltd and others. 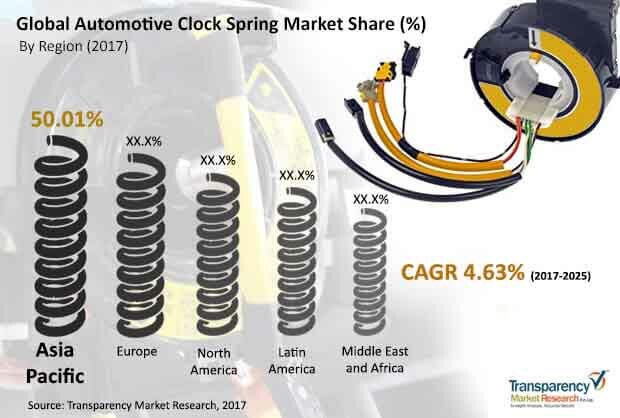 The study provides a decisive view of the global automotive clock spring market by segmenting it in terms of vehicle, and region. These segments have been analyzed based on present and future trends. Regional segmentation includes the current and forecast demand for automotive clock spring in North America, Europe, Asia Pacific, Latin America, and Middle East & Africa. The report also covers demand for individual application segments in all the regions. The report provides the estimated market size of automotive clock spring for 2016 and forecast for the next nine years. The global market size of automotive clock spring has been provided in terms of revenue and volume. Market numbers have been estimated based on key vehicle, and regional segments of automotive clock spring market. Market size and forecast for each major type and vehicle have been provided in terms of global and regional/country markets. Secondary research sources that are typically referred to include, but are not limited to company websites, annual reports, financial reports, broker reports, investor presentations, and SEC filings, internal and external proprietary databases, and relevant patent and regulatory databases, national government documents, statistical databases, and market reports, news articles, press releases, and webcasts specific to companies operating in the market, National government documents, statistical databases, and market reports, American Automobile Association, European Automobile Manufacturers Association, Automotive Research Association of India, Organization International des Constructeurs d'Automobile (OICA), National Association of Motor Vehicle Manufactures (ANFAVEA), United States Council for Automotive Research (US CAR), Society Of Indian Automobile Manufacturer (SIAM), WARDS Auto, United States Department of Transportation (US DOT), China Association of Automobile Manufacturers (CAAM), Japan Automobile Manufacturer Association(JAMA) etc. Primary research involves telephonic interviews for each market, category, segment, and sub-segment across geographies. We conduct primary interviews on an ongoing basis with industry participants and commentators in order to validate the data and analysis. Primary interviews provide firsthand information on market size, market trends, growth trends, and outlook, etc. These help validate and strengthen secondary research findings. These also help develop the analysis team’s expertise and market understanding. The study includes profiles of major companies operating in the global automotive clock spring market. Key players in the automotive clock spring market are ANGOTAN Auto Parts, Spring Works Utah Inc., Draco Spring Mfg. Co., MHC Linkway Auto Parts Limited, Sanwim Auto Parts, Jinzhou Jinheng Automotive Safety System Co., Ltd, Nardrun Electronic Technology Co., Ltd and others. Market players have been profiled in terms of attributes such as company overview, business segments, and product segment analysis. The market for automotive clock spring is primarily driven by rising demand for airbags in vehicles.